After 4 weeks of rising costs, Jacksonville mortgage rates finally recede. According to Freddie Mac’s weekly Primary Mortgage Market Survey, the average 30-year fixed rate mortgage rate dropped 7 basis points to 3.59% this week. Depending on where you live, however, you may find that your offered mortgage rates varies. Freddie Mac’s “published rate” is a national average based on a survey of more 125 banks. The rates you receive as an individual vary by bank, and vary by region. Mortgage applicants in the North Central Region were most likely to get the lowest rates of all applicants nationwide last week. By contrast, applicants in the Southeast Region were most likely to get the highest rates. Across all 5 regions, mortgage rates were quoted with an accompanying 0.6 discount points, on average, plus a full set of closing costs. 1 discount point is equal to one percent of your loan size. Closing costs vary by county. One year ago, the 30-year fixed rate mortgage rate averaged 4.22%. Today, it averages 3.59%. This 63 basis point difference yields a $36 monthly savings per $100,000 borrowed. On a $250,000 mortgage, that’s $1,080 in savings per year. 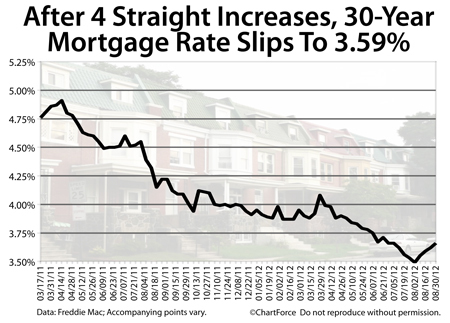 If watched mortgage rates rise through August and felt as if you missed the market bottom, consider this week your second chance. The 30-year fixed rate mortgage does remains above its all-time low of 3.49 percent, but this week’s drop in rates in encouraging. It’s the biggest one-week drop in rates in more than 3 months. Talk to your loan officer about how today’s mortgage rates can work for your budget. If you do not have a trusted loan officer, we would be happy to introduce you to some of Northeast Florida’s finest.